← With my new colors, I can DRAW anything I’m DRAWN to! Breaking the creativity barrier with color- Paradise Tumblers! Colored underglaze inlay through other colored underglaze layers… I hope it works out in the firing! I feel like a huge burden has been lifted off my shoulders for now… no more litigation crap for a while… I can see light at the end of the tunnel! For now, I can have normal fickle worries like roommate drama and boys. It’s refreshing to not be under a black veil of anxiety… and it might start showing in my work. I feel like I’ve been trying to stretch my own boundaries already, but now that I feel a little more light-hearted I just might break my own creativity barrier. 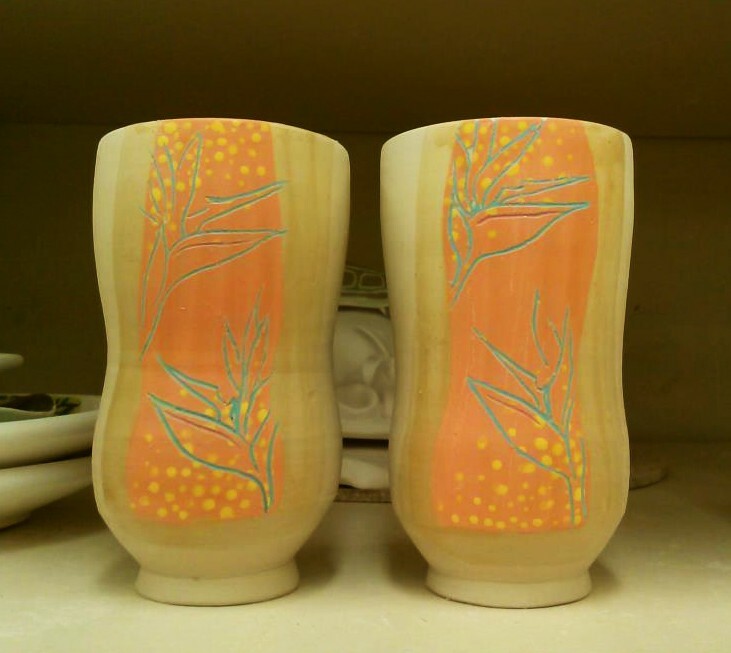 These tumblers express what I want to be doing– drawing tropical things that intrigue me on the surface of a strong form. I made a new rib in tool making that helps me get the bottom curve just right. I call it my “magic rib”, because it really does seem like a magic trick. The crazy part is that I didn’t even plan on it making such a difference… I wasn’t making these forms when I made the rib to begin with, but it makes a huge difference in how quickly I’m able to achieve that curve. This entry was posted in Art, Ceramics, Drawing, Painting, Uncategorized and tagged birds of paradise, ceramic art, kira call, tropical flowers, tumblers. Bookmark the permalink.